Merry Christmas (and Saint Stephen)! As usual my awaking was truly late, at 12 am. Then I did a smart breakfast and a shower. For the lunch we was waiting for my cousin Laura and the mom. 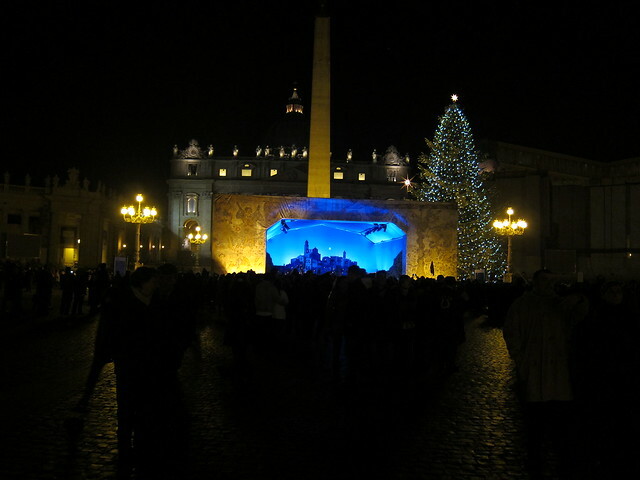 In the evening I went to Saint Peter and did some shots of the nativity installation (well it's not so beatiful but.. I had to do it!). After the Mass, I returned to my daily affairs: the TEDx Team page, the other computer to-dos and so on. But the main time after dinner was taken by comments on Facebook and phone calls. That's not a news, I know. Finally started working after midnight ─ I should change this habit. Merry Christmas, and since we're already in 26 December, St. Stephen!